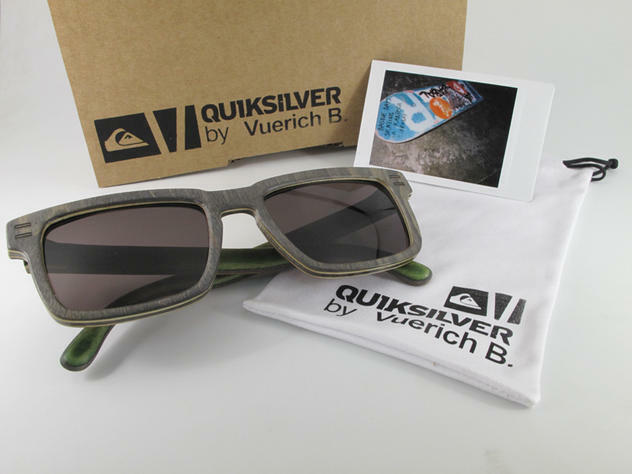 Vuerich B, the young brand from Barcelona dedicated to creating glasses from broken skateboards, is invited by Quiksilver to revisit "the griffin model" for a limited edition, all hand made. Vuerich, through long working hours, has developed a unique know-how to make original and responsible products.The solidity and the flexibility brought by the wood of skateboard deck make the ideal material to work with, being particularly adapted to the realization of this difficult and delicate technique. These glasses will be provided with CR39 polarized lenses offered by Carl Zeiss. The 50 pairs of this limited edition will be numbered by hand and distributed with a polaroid of the original board. Part of the revenues from these products is donated to skateistan, an association working on educational projects related to skateboarding in Cambodia.